The phenomenon of people arguing that voting SNP is the answer to all and every problem in the universe is becoming commonplace. There’s also been a rush to explain how voting for anyone or anything other than a single party next year is a futile folly. It’s a depressing and narrow orthodoxy in a country still undergoing waves of change and lies in complete contrast to the vibrancy and spontaneity of the Yes movement. The reality is that with Labour and Liberals eviscerated there is room for a ‘new pluralism’ – a political landscape that looks radically different from before, where parties, people and alliances with a common understanding, that self-determination is an essential goal, jostle in debate about the values and means and direction of our new country. It’s unity in diversity. It’s a far stronger position to build a movement for independence than the brittle notion of the top down singularity of one party. First – how do we increase the potential of getting another referendum? Second – how do we increase the chances of winning another referendum? Third – how do we increase the potential for that future independence victory to translate into genuine social change? The logic behind RISE is clear: we increase the potential of getting another referendum by building a relentless movement for change. We increase the chances of winning another referendum by building not just a majority of pro-indy voices in Holyrood but in communities and in real lived experience. And we increase the potential for that future independence victory to translate into genuine social change by breaking through the tired old orthodoxy of failed economics and failed politics. The tactic is clearly to capitalise on the failure of Labour, and, rather than just relish the schadenfreude of Labours demise, build an alternative that breaks new ground. If the 56 MPs at Westminster are to be celebrated, they are also, we hope to be a short-lived project. They are there as the Undertakers of Westminster, but the important work has to happen in Holyrood, where the Midwives are arriving. Taking votes from the old dead parties can create a parliament brimming with ideas and genuine policy debate. Because the reality is that Holyrood has been at times like a Holodeck of a parliament, with tired old politicians mouthing binary arguments across the floor. The common bond of the Unionist parties has been their absolute lack of imagination and policy innovation. The quality of the opposition has been dire, unimaginative and tribal. They are about to be removed. They, like the very concept of Britain are an evanescent force, fading away before our eyes. Imagine a parliament packed with people who actually believed in something? We who argue for transforming Scotland shouldn’t be averse to new and emergent forces rising up, we should embrace them. We shouldn’t be frightened of change and of radical new voices emerging from our movement. RISE has much to prove and needs strategy and guile, but the evidence is it has that in bucketloads. Unity in diversity is a much stronger base for transformative action than one-dimensional party politics. This is great, and gives the whole independence movement energy. The SSP isn’t new and as a parliamentary force is spent. Does anyone seriously believe that the next Holyrood election will see people voting for such a collective in numbers that create MSPs and risk not being able to once again send a message to the established parties ? The reality is that neither of these groups are currently electable, a coming together just makes that all the more obvious and confusing for the electorate at large. The Scottish Parliament was designed to make room for smaller parties, I don’t believe the current mood is for anything other than making sure UK parties get hammered. The left groups would do well to stay separate, accept that now is not the time to dream of a parliamentary voice and use the time wisely developing a clear vision and preparing for a climate when it once again is a possibility. United we stand , devided we fail. Why is this feeling of impatience taking over ? Who’s driving it ? I truly believe that the only chance of a referendum is supporting the SNP anything else is just a distraction. The inclusiveness of RISE is questionable simply due to its exclusion of Solidarity as a group or as individual members. Solidarity is on the Rise now and the greens offer a significant challange to The SNP ! Whether the left or even the old labour support will transfer from dissolussioned Snp members or voters I don’t know at present! Six months is a long time in politics and impact on social media or Television will be important to the success of those seeking support from the electorate. However guille is not a quality the public admire so at the outset Mike Small is indicating the same old political intrigue and plotting . Perhaps we should consider that even a temporary increase in support for unionism or unionist labour in Scotland due to false hope of the Corbyn effect will be damaging to our aspirations. The SNP is a broad church and SSP leader Colin fox has said SNP is no place for socialists the only electable progressive Party is the SNP for constituency vote. Our Smaller parties on the list RISE Solidarity or the Greens have more in common that separates them so really should form an alliance rather than splitting the alternative independence Parties . Spot on. We need a diversity of voices and choices but the central aim must be independence first. Once we can attain that aim we need to discuss argue and select the best way forward. As I’ve said in several other posts I plan to vote SNP/Green or RISE depending of what happens between now and then. RISE have to produce a credible economic plan supported by experts. As far as I can see you don’t have this yet? If you can produce this, then it’s game on. If you can’t it’s game over. You can convince a number of NO voters that Westminster rule is downright corrupt and democratic. Will the vote YES? No they won’t, because they’re feart! For me a blank piece of paper is enough. But I’m not in the majority. Wholeheartedly agree with every word Mike! Found myself on the wrong side of a few forum threads and actual life discussions where I couldn’t understand how a Holyrood chamber brimming with a diverse Independence supporting group of MSPs, having reduced the Unionist parties to a rump, if anything at all, because there are more choices within those who do support it, and 56 SNP MPs in Westminster(who are after all there for at least the term of the Parliament if we don’t see material changes before then), was a bad thing or a threat to the trajectory of the movement. I ultimately could only determine a growing partisan nature in the claimed ownership by one party of something which should still belong to the movement in general. A poster yesterday described a scenario where they would hate to hear a news report after the election describing a reduced SNP presence in Holyrood because it would play into Westminster and the MSMs hands and could take the momentum away from the entire movement…if that same report said, ‘…today, Scotland returned a reduced majority for the SNP administration, who still form by far the largest party in the chamber. The surprise result is that no other party returned enough MSPs to formally be called an opposition, with the decline of Scottish Labour continuing unabated. In order to form an opposition, Patrick Harvie of the Scottish Greens has invited the MSPs from new party RISE to enter a coalition pact. This is seen by some as a climb down by Harvie after his party were initially invited to be part of the RISE group. This turn of events effectively leaves the Holyrood chamber with no significant Unionist party influence, with Labour, Conservative and Liberal Democrat parties now all having less than 5 MSPs each!’; now that couldn’t be spun by Westminster, through the MSM, into ‘it’s all a cult’ and ‘their just voting with their hearts’ and ‘they don’t know what their doing, how is this one of the most politically engaged electorates’ or ‘it’s a one party state’ etc etc! I’d certainly be happy at that! Exaggeration doesn’t do the argument any favours. I can’t recall anyone on the various fora I visit using such hyperbole. Most recognise the shortcomings of the SNP, know that it is a rainbow coalition but is the party most likely to bring about Independence, after which it’s all to play for. When I started visiting Bella last year I was impressed by the depth and rigour of the arguments, but, sadly, it seems to have become more polemical recently, rather than reasoned. We all need to be critical of all of the parties; not just the unionists. I’m an SNP member but am nagging them about the lack of an A&E north of the Clyde. The left usually can never agree long enough to be relevant and I hope, this time, it’s different; the Greens are often unrealistic while having great aims. All parties need a broad church and to listen to the different strands avoiding the doctrinaire approach. At the last Dundee RIC meeting earlier this year we had a new person who stated she was SNP (Not a problem on either point per se) stand up and tell us off for daring to the criticise the SNP in terms that claimed only the SNP ran the referendum and we should be grateful. The ignorance of what RIC did in the referendum was bad enough, but to try and tell a room full of experienced, committed activists that they did nothing was breathtaking. In the Yes city too. I had someone online do the same thing to me as well. The phenomenon is a real one. Under every article about the Greens or Rise or the SLP there are endless people repeating the mantra that we all must robotically vote SNP:SNP or we are betraying the goal of independence gets trotted out. As though my democratic choices are to be constrained by fiat. I am not a member of the SNP or any other party. I have habitually given my list vote to the Greens for the last two Holyrood elections at least and don’t see why that scheme for someone other than the SNP cannot continue. I may well not vote SNP in the constituency either. Shona Robison voted against the Assisted Dying bill. I sent her an email complaint and never even got so much as a reply. So it looks like both my votes are up for grabs. Only to Yes parties mind but there’s a plethora of those to choose from. Not exactly constructive or true. I understand Colin has to differentiate RISE from the SNP but attacking it and attempting to drain off its Yes supporters rather than opposing Scottish Labour and Tories seems short-sighted and self-defeating. The best placed party to fully wipe out Labour, Tories, Libdems and send a clear message to the UK Govt remains the SNP. Holyrood 16 is a good place for RISE to set out its stall and go on to build a strong identity at local council and national level but I would think letting SNP finish the job and clear political space for RISE to occupy beyond 2016 is the best option. Holyrood is an entirely different beast to the General Election and the danger of losing SNP majority to a 3 party Unionist coalition could undermine all our long term goals. Unlikely as that scenario may seem, remember this system was designed to preserve Labour and I don’t want to allow even the remotest possibility of it. I wish RISE the very best and will follow with great interest but I’ll be voting SNP/SNP on this occasion. I’m 46 and have voted SNP in every election since I was 18 and I haven’t missed many votes and I welcome this new party. The SNP have done a great job getting us to the point of a referendum, an incredible job actually but we have a broad movement and that should be reflected in the political make up of those standing for Holyrood alongside the SNP and the Greens. The SNP need to be pushed as a government and any opposition worth its salt should always be more radical than the sitting government. Having unionist opposition whose outlook for Scotland is almost shaped entirely by their role as agents of the State just warps the debate and sets a limit on the punters confidence in the standard of politics and politicians in the parliament. The criticism of the SNP with regard to NATO and the Monarchy (I am as vehemently against both) is justified but a little unfair at the same time. They were trying to win a referendum and those were the chosen tactics (I accept there are a few in the upper reaches of the party who support the NATO project but a large majority of members old and new are against both. The old members were sold those tactics on the basis that it would be easier to explain to those not already convinced of the need for self-government to vote for Indy. A few weeks ago the SNP/Scot Gov re-enforced their long held opposition to GM crops in Scotland. This was a logical but brave and principled move by a Government that is often criticised for being too timid. Since they announced the ban (based on three principles set out by Richard Lochhead in 2013) the Scottish Government have come in for a colossal amount of criticism. Monsanto and the like are powerful and I expected a lot more back up from the Indy movement. That said good luck to the new party. The sooner it takes unionist seats the sooner we will have our Independence. Then we can do something about the monarchy. Why are you against Nato? Norway isn’t. Thankfully everyone I come across both on and offline celebrate the fact that there are other pro-indy parties and that they are on the left and recognise, as Mike says, that this is good for our politics and for our parliament. Where people diverge is clearly with regards to how this may help or hinder our prospects of independence, and this will obviously largely be weighed up based on what we think will most likely get us there (and this is anything but straightforward). For example the Greens have been a brilliant pro-indy voice, as well as a voice that in many way diverges from the SNP and encourages debate on important issues (and seems to be largely forgotten by RISE). However their view at present is that without control over monetary policy we should not campaign for more powers for the Scottish parliament whilst in the union. This has quite understandably led many to decide they won’t give the Greens their list vote, because they want more powers for Scotland within the union as part of the path to independence and the Greens aren’t offering that. Some even think this stance from the Greens may have a detrimental impact on our chances of winning our independence. Complicated. I have spoken a lot on this just yesterday on another thread on the SNP and RISE so won’t repeat myself here in detail – I will simply say that attacking the integrity of the people within the SNP, not least from a self-righteous place of ‘our party is a much more valid expression of all the values you say you have’, isn’t progressive, isn’t a form of valid criticism, isn’t helpful for our independence movement, and certainly isn’t an expression of solidarity. To be clear this isn’t a judgement on Mike’s article – this is an overall theme from most of the articles and rhetoric I have heard so far. But it is relevant here because there are people like myself who want to celebrate RISE even if I am not gonna vote for them, but as of yet I can’t because I am not seeing something akin to the Greens in how they conduct themselves, I am seeing something akin to the unionists in terms of their tribalism when it comes to the SNP. If this changes don’t be surprised if RISE gets a lot more support. But if it doesn’t it leaves people like myself alienated. And I would highlight to Mike that this clearly has nothing at all to do with the narrow view that there shouldn’t be other new pro-indy parties full stop. It’s too early to tell what will happen – and with the people involved in RISE I have very high hopes. I would just say at this early point – you have wonderful people with a wonderful platform and an enormous responsibility. Please embrace yourselves in a way where you show solidarity with the rest of us – this doesn’t mean there is no room for valid criticism, as we have seen with the Greens – it just means that we practice our politics progressively, and I would argue we need this in Scotland just as much as we need anything at all…..I would also argue that without this our movement will fail. The tone of Rise appears to be the classic divide and rule tactic,I only hope I am wrong but then again I am to old and long in the tooth which perhaps makes me more cynical,time will tell! Thanks Kimberley. One wee correction though, you say ‘it is surely too early to form any kind of overall sense of what this party is actually going to contribute’ – but it’s an alliance not a party. That may seem like a pedantic distinction but its an important one. Mike, you should know fine well about divide and rule. You are playing straight into the hands of the British establishment. The phenomenon of people arguing that voting SNP is the answer to all and every problem in the universe is becoming commonplace. This is absolute nonsense. Funny how you never came out with this kind of a rhetoric between 2007-2011. The SNP campaigned very hard for a devolved Scottish Parliament, let alone holding a referendum on independence, which was dismissed by many people in Scotland as a pipe dream. The 55 per cent who voted No last year were not won over by radicalism. Once you acknowledge that Scotland is a conservative nation (a small c), then you can start to devise a real strategy to achieve independence. I want to achieve independence for Scotland. It should be patently obvious that this is not going to come about through shouting about radicalism or socialism. Nail hit squarely on head again Muttely. I canvassed the schemes with RIC in the referendum and there are a lot of Left people there, many of whom are happy to self identify as socialists. Just recently we had the British political attitude survey which showed a big far Left tail here in Scotland, the only part of the distribution where Scotland really differed from England. Are those people to be unrepresented in our parliament? Look at the turnout in the GE compared to the referendum. Where did all the referendum people go? perhaps they did not see anyone representing them standing and they saw the futility of opposing the SNP juggernaut. There is a constituency for the Left in Scotland. The problem is disunity and too many parties standing, splitting the vote. Rise is attempting to fix that. As someone in RIC I expect to be out in the schemes working for Rise, identifying a constituency for them and it may well be one that is not currently voting for anyone, let alone the over entitled SNP. Be proud of your work in the schemes, muscleguy. It was you and your comrades who made the difference last September. Your points about representation are thoroughly sound. It seems as though the SNP welcome opposition with open arms, just so long as they don’t actually oppose. I’m a supporter of left policies as much as any, but there is a failure on the left to distinguish between the SNP as a party campaigning for Independence, with all the compromises that demands so as not to frighten the horses, (e.g. Nato, Monarchy, Sterling etc) and the SNP as an administration – with its hands tied behind its back by WM on the one hand and being comprised of those from the left, right and centre and all the compromises that also entails. I agree with most of the above,we have to get those with vibrant/imaginative ideas that are sound and appealing,i would like to see the nationalisation of all the utilities but it has to be explained why and how it is being done and why it will benefit the country as a whole,someone has to introduce a housing policy that is easier and more affordable for the young,we have to show that life does not have to be a total drudge,every able bodied person has to contribute,the biggest hurdle is getting the correct message out to everyone including the ditherers. Why should I devote any time or attention to an article which opens with such an inane straw man? It has ALWAYS been obvious that it will take more than the SNP. One of the reasons the NO side won was that they concentrated on the SNP, ignoring other harder to hit targets like RIC, Common Weal, Business for Scotland etc. So, in that respect, the article states nothing new. What’s depressing is the numerous SNP BAD references. The unionists will continue to try, in independence terms, to make it all about the SNP and we need others to draw their fire, not add to it. So good luck to RISE and the Greens in next years election – I’m hoping for a more diverse parliament too – but argue FOR your case not against others. If you are serious about Scotland becoming an Independent country then you must vote SNP/SNP. It is not about policies or personalities it is to do with the voting system. Anybody who supports Independence and gives their list vote to a minor party which supports Independence is talking a huge gamble. If as expected, the SNP take nearly all the constituency seats then it will be hard for them to win list seats. Any vote for a minor party will reduce the chance of the SNP getting list seats but with no guarantee that unionist parties won’t get them instead. If you vote for a minor party in the list vote, you have the certainty of reducing an Independence party (SNP) chances of getting list seats and no certainty of other Independence parties gaining list seats instead. Patience and discipline is what’s required at this time and a united front lead by the SNP and supporting the SNP is the best way to getting Independence. All this new party palaver is a distraction like the recent rise and fall of the (SIP) Scottish Independence Party who lasted a few days I expect the RISE party will fizzle out toot sweet. It’s SNP all the way. I often find myself punching the air and wiping away a tear when reading stuff on Bella. Ideas sometimes beautifully expressed and inspirational. This last eighteen months my consciousness has been raised repeatedly. I’m a lefty. I’d go all the way, the black jammies and a turn at tattie-howkin’ and everything. At the first election after Independence Day I’ll vote for the looniest, radicaliest, whackiest leftist standing. I welcome the pluralism of a pro-independence party to the left of the SNP. Though I did think the SSP was that party! However I am dismayed to learn that Rise will make quitting Nato a key policy plank as this makes it unelectable except as a fringe protest party. Quite what the left wing opposition to Nato membership is I do not know. I think a better stance if they are critical of Nato would be to leave the question open and subject to a plebiscite post-independence. Nato is a highly successful defensive alliance and opposition to it would be seen as dangerous by the international community and by current Nato members. I cannot see Scotland ever achieving independence without international backing. To think that we can achieve it by a plebiscite alone is naive and parochial. We do not need to court enemies abroad, we have enough to do fighting the British state, which is viewed very positively in international circles. We have to show that and independent Scotland would also be a valuable partner and ally internationally or we are unlikely to gain any support. We only invite hostility and opposition by being opposed to Nato. An SNP majority. SO, pretty obvious how that gets achieved – both votes SNP. Convincing No voters to vote Yes. So far, RISE has shown no desire to appeal to those voters, only to try and exist off consolation votes from SNP supporters guilt-tripped into giving them their list vote. I don’t see how that helps grow the overall movement. By promoting policies rather than trying to appeal for tactical votes? 1) to win another mandate we need a majority of pro-indy MSPs, and as the SNP leadership will tell you, we need a coalition of interests to be at the forefront of demanding one both in and out of the parliament. If the opposition is pro-indy we will be an a very strong position indeed. 2) so far RISE has done three things. Firstly we have carried out over 30 policy forums all over Scotland, secondly we have drawn together an impressive conference showing the array of forces involved, and thirdly we have released the name. Given we have not launches yet the argument that we have not appealed beyond our base remains to be evidenced. It is a challenge, but there is undeniably a constituent which RISE can win to arguments for independence which the SNP cannot (this is a key lesson of the independence movement 2012-2014). 3) again – we have not launched our policy platform or our campaign strategy. You will see that both will play constructive and energising roles in the 2016 campaign that will put socialist and radical left arguments at the heart of the debate. That is a good thing for our politics. Judge RISE on the acid test that is to come in future months. What kind of voter is it you think you can win that the SNP can’t? The hard work is convincing the 55% who voted No. Some of these are ignorant, opinionated, or risk-averse pensioners; others, including the bulk of rUK immigrants and Anglo-Scots feel little sense of Scottish identity and are too comfortable in their middle class skins to risk losing any of it. Somewhere amongst them is a nervous or ignorant No voter who is leftish leaning but mostly disinterested in politics. You might stand some chance of winning their votes. A diverse Parliament, but can someone explain where RISE is going to get the voters from to give them MSPs? We want to clear out Unionists, has RISE got a strategy to attract those votes from the Tories and Libdems? And which “NO” voters are going to be convinced by RISE to vote Yes? Both your and Brian Powell’s questions remain unanswered as far as I can tell, from RISE and Mike Small. Instead of having a sophisticated strategy, it appears that in its place is a massive SNP Bad message. This is kind of baffling given that this is essentially what unionists in Scotland have been doing for decades. Unionism in Scotland is far from a busted force, after all it secured a No vote last year. The danger of reading too much into the general election result should be obvious, the unionist vote was split three ways, while the independence vote largely went to the SNP. Even then, there was clearly voters who voted No in the independence referendum, who voted for the SNP in May knowing that there was very little risk in doing so. I have yet to read or hear how RISE plan to gain the votes of those who voted No last year, and their support for independence. After all, if you want to achieve independence, then that is how it is going to be achieved. Instead there appears to be a pronounced desire to bash the SNP, seemingly in a unionist type manner. To achieve independence we have to attract support from those who voted No last September. How exactly is this SNP bad mantra of RISE going to help achieve this, given that to me it seems to point in the exact opposite direction? Future for independence will always lie in one answer , fiscal proof. The indy ref failed on rallying the no voter , they have at least a few years to get that right , so power should be diverted to this while the SNP is in a majority at Hollyrood. First prove the economic cause removing the power of a fear campaign once again , ie pound or euro , oil and beyond , pensions , benefits , nhs and taxation as being autonomous with proof of implementation. In a land that gave the world the idea of economics , helped create the industrial revolution and modern medicine. The argument that we are too small to be anything other than a 3rd world northern European beggar is laughable….. we are already cap in hand to westminster , but only because they have used its 1 trillion dollars of Scotlands wealth since the 70s , where we are only returned the deposit on the empty Irn Bru bottle , that your typical English voter calls the barnet formula and wants it. Secondly the takeover of the SBBC as a Westminster mouthpiece , and new acts of new power against the media including print and online. I do realise that during indy project fear had controls on the media. To date not one lie has been punished , not one new law created in Scotland to prevent it ever again. This from a party that lines the pockets of lawyers too. Notably Nick Robinson , editor in chief of the conservatory party in the BBC was removed to radio 4 because Cameron said he wasn’t impartial , then why hasnt questions been asked since about the supply of impartiality when editor of the bbc political news during indy? Do you see the SNP politicians gearing towards any of that , no , why not , they are happy to be in power for thier sake or blaming others , not creating power for the betterment of the Country . just dont look behind the curtain SNP voter and all will be well. While most will already know I have seen the cracks in the Cement that is the SNP , in that they are no better than any other party , but worse if they are allowed to ignore thier polcicies and no one questions them. Land reforms that are not land reforms at all in council majorities , whom ignore communities by allowing the use of farmland to make lorded landowners richer – under their lie of affordable housing that is not affordable at all and 100 year to supply Council housing touted as a triumph. Not all is rosy with the snp , without another party to question and police them , then they are the Tartan Tories of yesteryear. I just hope RISE is not another SSP or SNP with its veneer of socialism fooling the socialist workers. I hope there is a new party , but remember it took towards 100 years for the SNP to get where it is now from its nationalist , if somewhat terrorist roots , just the same as the History of Hardie , the weavers strikers etc that created the Labour party that only exist in history books today. This is the kind of needless SNP bashing that I mentioned in my post. The SNP campaigned for decades for a devolved Scottish Parliament, in fact after Labour dropped their commitment to Home Rule completely in the 1950s, it was left to the SNP alone to carry both the independence and Home Rule banners. It was the SNP’s victory in 2007 that completely changed the face of politics in Scotland, and it was that party’s success which paved the way for the independence referendum last year. Now you clearly think all of this is not significant or important, but it is to some people. Ranting about Tartan Tories, socialism and anti-capitalism etc is not going to achieve independence. The argument earlier in this thread – made by Jonathon, that RISE can reach those groupings which the SNP cannot is problematic. One scenario might be that the success of RISE or any radical socialist grouping for that matter, is likely to be made by gaining votes FROM the SNP on the second vote. That is why RISE is positioning itself as a protest party, hence the emergence of a critical tone towards the SNP. But that strategy might spectacularly backfire if the tone comes across as arrogant and sectarian – Colin Fox take note when talking to journalists. We also need to be aware of the gap between hype and performance. RISE is talking itself up, quite rightly, but they are a long way from electoral credibility. The have no costed social policies, no leadership figure the mass of people can relate too, and they talk up a social movement, which exists, but is probably smaller and less influential than they make out. That’s the key. If we can do that, then all the better. If were merely trading votes with each other within the 45% (or whatever it has risen to now), then it’s a pointless exercise at best, and a danger of letting the old dead parties rise from the grave themselves at worst. This SNP-bashing by RISE and their supporters is risible. Perhaps RISE would like to point to the radical left which has been successful in the UK, or even in Scotland. They usually disintegrate within a very short half-life. Even the Labour Party has fractured several times in its history. So they have no historical credibility on which to base their bashing. Perhaps the only truly radical administration, at least for a few years before it became sclerotic, was Attlee’s post-war administration which introduced a number of socialist policies which lasted until the advent of Thatcher and the triumph of greed. These values need to be re-stated and developed for current circumstances. 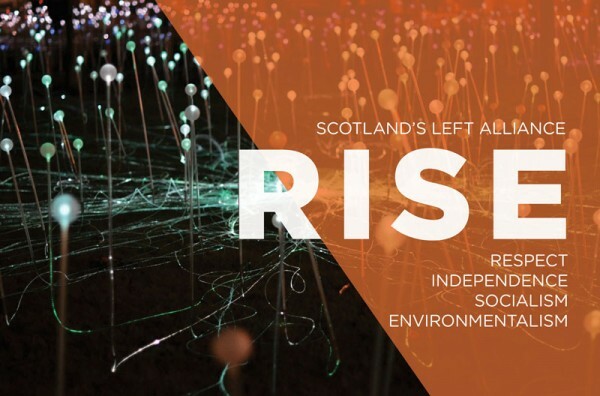 If RISE is to be a success then it needs to be more into a left real-politic than doctrinaire radicalism and to work in concert with the SNP, critical, yes, but constructively. As others have said, fighting amongst ourselves may ensure Unionism snatches victory from the jaws of defeat. Here we go again with RISE again advocating anti SNP this and that. They are blind to the fact that all our SNP solidarity is already only temporary until we achieve Independence. They moan about one party politics instead of seeing the big picture which is social change and only one party is capable of delivering that at the moment and that is the SNP who have our complete backing. They are trying to flog the dead horse of the old Labour support who have abandoned them in droves because none of their Labour Party leaders were in touch with the people, or were too busy trying to take Scotland further to the right under their Blairist ideology, and missed the fact that the people of Scotland have been monitoring their failures since 1979 and now have had enough. We tried the rest, now we’re trying the best, and that happens to be the SNP who are delivering social change, however slowly, under severe restrictions from Westminster. We already have a Parliament packed with people who believe in something and they are our Scottish Government, who we trust implicitly. As I commented a couple of days ago on their last newsletter, we the people, ARE the change, not political parties of any persuasion. We are the ones who will decide direction before, during, and AFTER Independence. I wish the left would stop trying to confuse and cloud the real issues in Scottish politics today and just stay in solidarity with the main body of the grassroots YES movement until Independence, when their viewpoints will find voice in our open Government just the same as everyone else’s.